The worlds of Star Wars and Games of Thrones first collided with Gwendoline Christie’s Captain Phasma and most recently when the Mother of Dragons herself, Emilia Clarke, joined the galaxy far far away in Solo. But Clarke wasn’t the only one from the Seven Kingdoms who stepped foot on the Solo set. Your favorite Thrones direwolf made a cameo that you definitely missed. The latest episode of The Star Wars Show revealed that the beloved Northern Inuit best known as Nymeria on Game of Thrones had a small role in the Han Solo spinoff. If you don’t remember a familiar white and grey dog running around, that’s because Arya’s pup was in disguise as a Star Wars creature, of course, green screen tail and all. The episode shows Pablo Hidalgo of the Lucasfilm Story Group hanging out with Saxon, the dog who plays Nymeria, and two dog trainers. Saxon is a Corellian Hound in the movie, trained to wear a suit that makes him look like a creepy space beastie. He’s one of the same vicious beasties, in fact, who chases Alden Ehrenreich’s Han as he’s fleeing from Corellia. 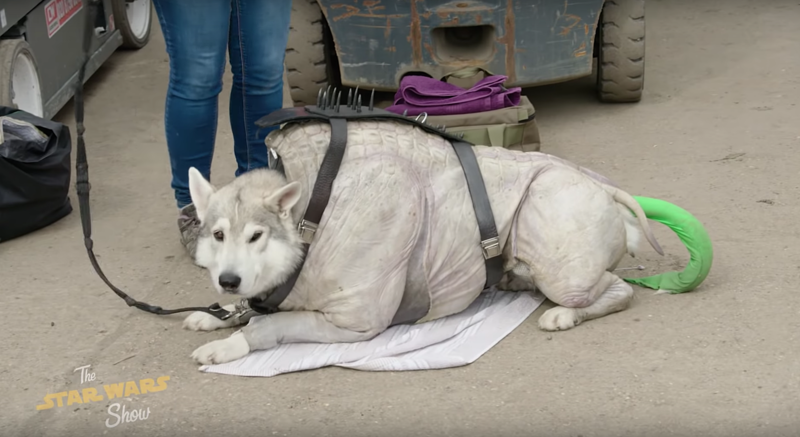 Check out the Star Wars Show episode starting around 3:10 to see Saxon hanging out on set in his hound suit, and prepare to get all the feels as you remember Arya and Nymeria’s tearful reunion from Season 7.